WinZip is one of the most popular file archiver and compression utility for Windows, Mac and Mobile. WinZip is a paid program with a free 21-day trial and its standard license costs as much as $29.95. 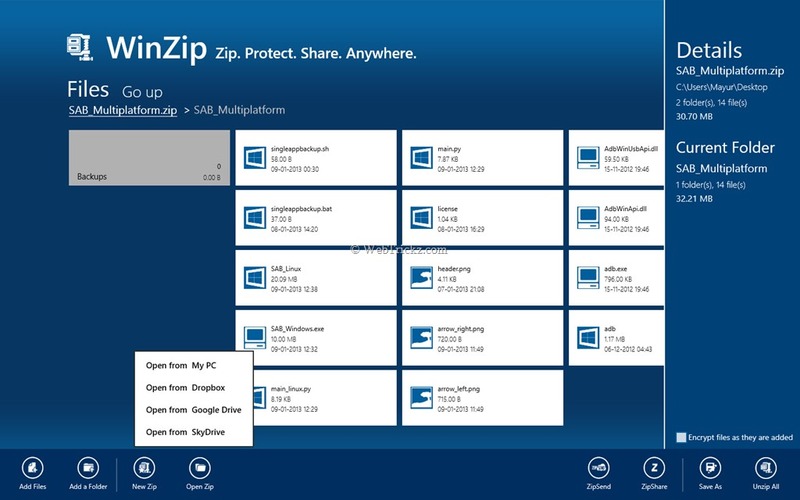 WinZip app for Windows 8 is now available as a freeware in the Windows Store. The app works in the Modern UI environment, thus with an entirely new and different UI when compared to WinZip’s desktop client. WinZip for Windows 8 offers a clean touch-friendly interface, advanced sharing options and the ability to share large files up to 2GB via email with ZipSend integration. You can open files and folders from your PC or cloud services like Dropbox, Google Drive and SkyDrive, plus can unzip the archive to any of these locations. The ‘Zip Share’ feature makes it easy to securely share files with your friends, followers on social networks like Facebook, LinkedIn, Twitter and through email as well. Password-protected important files are secured with WinZip’s military-grade encryption. The exclusive zipx compression format can compress files even more, including JPGs. With a modern touch-friendly design, WinZip for Windows 8 offers an effortless experience on PCs and mainly on tablets. It aims to deliver same zip technology as the desktop version of WinZip, but in a simple and easy-to-use package. It’s not freeware. It’s free to try for 15 days. After users need to pay a subscription fee of $7.99 per year. Windows Store doesn’t appear to differentiate between the two offer types. Where’s the free download link.